I received the most charming gift yesterday. It was a package of homemade biscuits, wrapped in cellophane and bubblewrap and carefully packed into an express courier bag. A vintage-look postcard told me it was from Andrea, my Penguin publisher. 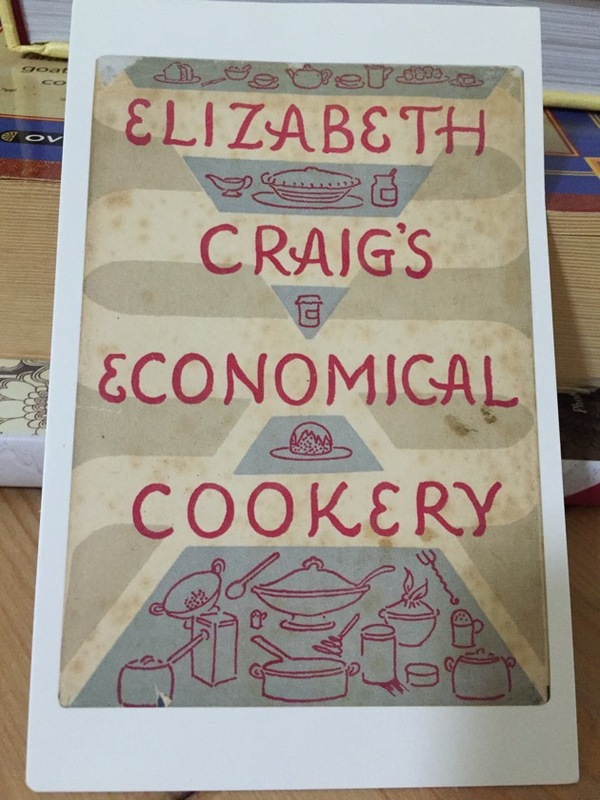 My new book was her last project for Penguin. In The Simple Home you'll see a photo of a beautiful wooden embossed rolling pin and when I asked Andrea about it she said it was hers and she was hoping to use it when she left Penguin and had a short holiday before starting work again. It looks like she was good to her word, as usual, because the pattern you see on the biscuits was made with that rolling pin. Thanks Andrea. You're one very special lady. 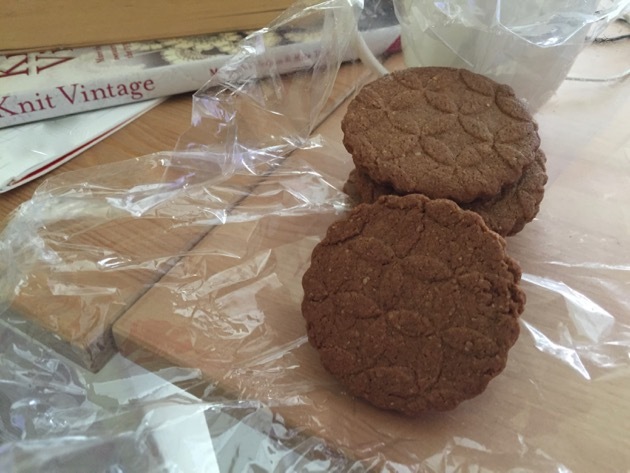 They are the best ginger biscuits I've ever tasted. Wendell Berry's thoughts on the good life. This is a wonderful resource from Milkwood about foraging seaweed for home and garden use. Please check your local regulations to make sure you're allowed to take seaweed home. How a food budget got us out of debt. Kevin TV, local food - please note, there is some vision of hunting and dead animals in some videos. Meals that mark life's milestones. A hopeful nature is a blog written by one of the women who came to my blogging workshops late last year. Enjoy your weekend, my friends. One week in and I can see many home projects ahead just waiting for their time. I'm working on a small patchwork today. What are your plans? Looks like a wonderful read. What a sweet mail treasure. Today I've been mostly making things with a batch of pastry and stashing them for future meals in the little space I have left in the freezer. I was determined that the Christmas leftovers would not go to waste. So fillings for pasties and pies and most of the cheeses were cut into wedges, individually wrapped and popped in the cheese box in the freezer. How wonderful to have a patterned rolling pin...and to send you some of that delicious looking biscuit bounty! I'm looking forward to a cuppa and a sit down later after chores are done to have a look at Darn and Dusted, I really enjoy darning and making boro-style patches on worn but favourite clothing. And as well as mowing and mopping, my plan is to do some mending, a friend has asked me to patch her favourite jeans, and is happy for me to unleash my creativity on them. Enjoy your patchwork Rhonda, and have a good weekend too. We are currently torn up as we are remodeling our kitchen a bit. Not much cooking/baking going on here as I have not stove at the moment. I hope it will be able to be hooked up again soon. I'm going to cast on a new dishcloth tonight...I taught myself by watching a video on Youtube and I love it! Happy weekend, everyone! We begin that same project on Monday. Exciting but what a mess and I am sure we will be happy to get back to home made meals and such by the time it is finished. Enjoy your new kitchen! Such a thoughtful gift from Andrea. Thank you for sharing the links ~ Darn & Dusted's work is amazing and the post about native bees on, A Hopeful nature's blog was an interesting read. Weekend activities: harvest the ripe tomatoes, pull a few weeds and maybe find time to do some machine sewing on an improv quilt top. I love the sashiko-style stitches in one of the photos on Darn & Dusted. Now I"m going to have to wait for something to rip suitably just so I can try it! I look forward to your weekend reading links. Good to be back in 2016! That is a truely thoughtful gift. I would love to have a embossed rolling pin. Thank you for sharing those links! The rolling pin made such a pretty texture. Reminds me of the springerle pins. That pattern is lovely! I am off to make some fabric buckets for storing stuff in. what a lovely gift to receive in the post! I have had a fabulous weekend - yesterday hubby and I bought three POL chickens to add to our two. One of ours has stopped laying so we were only getting about three eggs a week. As you can imagine these eggs were like nuggets of gold!! The introduction has gone much better than I expected. Previously it has been very stressful as it seemed to take forever for the pecking order to establish but today has gone well - I even had an egg from a new chicken!!! Today is my birthday and eldest son has cooked the main meal - beef stroganoff - yum!! I have already had my birthday present which arrived last week - Miss Maggie Rabbit. Now I just need to make the time to sew her! Hope you have had a wonderful weekend Rhonda. I really enjoyed the interveiw with Wendell Berry that you posted. It was so interesting and made me curious for more. By chance has anyone read the book by Synge on the Aran Islands that Berry mentions? I love the idea of have your useful and functional things be beautiful as well. Hi Rhonda, I have both of your previous books and would like to purchased the new one when it becomes available. I live in the US. Do you know where I will be able to purchase it from in the US?